4" inlet/outlet overall diameter is 10"
Please read and understand these instructions before you begin installation of your DRY04. Save these instructions for future reference. 1. Never use this product to exhaust hazardous or flammable materials, vapors or gases. 2. Use this product only for its designed and intended purpose. 3. When the existing vent opening to the outside of the dwelling cannot be used and a new opening is required, use caution not to cut through pipes or wires that may be in the wall. 4. Ducted fans must be vented outdoors. 5. Whenever venting air to the outside of a dwelling, adequate provision must be made for replacement air. Without replacement air, negative pressure may develop. This will cause a deadly situation when fuel-burning equipment is used such as gas furnaces, gas water heaters, etc. The negative pressure will cause exhaust gases from such equipment to enter the dwelling. These gases contain deadly Carbon Monoxide. (As a general remark, install a Carbon Monoxide detector in your home). Follow the heating equipment manufacturers’ guidelines and safety standards such as the National Fire Protection Association, the American Society of Heating, Refrigeration and Air Conditioning Engineers and all applicable codes. If you are unsure about this matter, you must consult a certified heating and ventilating contractor. 6. Before cleaning or performing service on your DRY04, make sure that the electricity is shut-off and make provisions to prevent accidental turning-on of power such as locking the service panel or attaching a very prominent warning sign on the service panel. 7. The fan impeller of your DRY04 is powerful enough to cause serious injury if contacted. Appropriate safety precautions must be taken during installation, servicing and operation. 8. Qualified individuals must do the installation and wiring in accordance with all applicable codes & standards including fire rated construction. Refer to Fig. 1 for suggested installations. To calculate “equivalent” feet, measure the total length of the metal straight duct sections and add 5 feet (1.5 meters) for each bend that is installed. Then add another 5 feet (1.5 meters) for the screened outside exhaust hood. 1. The mechanical and electrical installation of your DRY04 must conform to all applicable national and local codes and standards. If unfamiliar with these codes and standards, you must consult with certified and qualified commercial installers. 2. Never expose your DRY04 to air temperatures in excess of 140°F. (60°C). 3. Do not use the DRY04 if the instructions of your clothes dryer specifically warn against the use of a clothes dryer booster fan. Find those instructions and review them carefully. If you cannot locate these instructions, contact the manufacturer for a new set of instructions before proceeding with the installation of your DRY04. 4. There are important rules concerning the length of duct from your dryer to the outside of the dwelling. It is unlikely that you will need a booster fan if the total length of the duct is less than 15 feet. This is assuming that the duct is at least 4” in diameter, has a smooth and clean internal surface, is galvanized sheet metal and that the outside vent is unobstructed. 5. Do not install your DRY04 closer than 6 feet (1.8 meters) to the dryer air outlet. 6. Do not install your DRY04 in a duct with a total equivalent length of less than 25 feet (7.5 meters). 7. Do not install your DRY04 in a duct with a total equivalent length greater than 140 feet (46 meters). 8. A lint trap (field supplied) must be installed between the dryer and your DRY04 in the event the DRY04 is located less than 15 feet (4.5 meters) (linear feet, not equivalent) from the air exhaust of the dryer. 9. Use only galvanized 4” diameter sheet metal duct pipe and bends. Flexible metal duct may be used if allowed by the applicable standards and codes. 10. It is best to install your DRY04 as close to the duct outside outlet as possible. 11. Your DRY04 must be installed where it is comfortably accessible for required maintenance and service. 12. Ensure that all components of your installation are securely fastened to rigid surfaces. 13. You may install two small lengths of flexible duct with hose clamps (field supplied) where the metal ducts connect to the DRY04. This will help reduce vibration and resulting noise. See Fig 2. Ensure that the airflow through the duct and booster fan does not exceed the free airflow of your dryer. Free airflow is the airflow from the fan inside your dryer without any duct attached and can be found in the instructions provided by its manufacturer. Over-boosting may result in longer drying times because heat is removed so fast that the heating element in your dryer cannot maintain the desired drying air temperature. The installation work and electrical wiring must be carried out by qualified persons and conform to all national and local codes and standards. Make sure that the electricity is shut-off before starting the electrical work and make provisions to prevent accidental turning-on of power such as locking the service panel or attaching a prominent warning sign on the service panel. 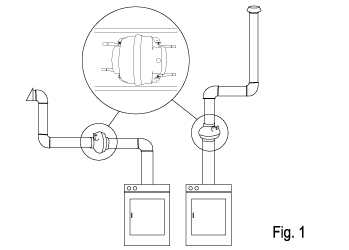 Since the dryer operates on 240 VAC, there will be 2 breakers for the dryer in the service panel. This can be one large breaker with 2 handles or 2 separate breakers. The handles on these breakers may or may not be connected with a rod between the switches. Make sure both breakers are turned OFF! Do not turn the electrical power back ON until all electrical connections are completed and secure and all electrical boxes are covered. 1. After installing your DRY04 in the chosen location you will need to bring electric power to the fan. 2. Locate the power feed wires to the outlet that your dryer is plugged into or electrical box the dryer is hardwired into. 3. Install a 4”x 4” deep electrical box next to the box of the dryer connection (outlet or hardwired) and connect the two boxes using rigid ½” conduit and connectors. Then install the Current Switch provided into this box. individual 120 VAC conductors (usually Black or Red) are each supplying 120 VAC from separate breakers in the service panel. 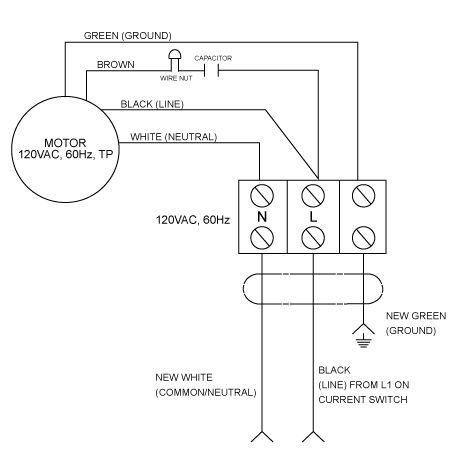 The other wires are a White common (neutral) conductor and the Green (grounding) conductor. If you find different color wires or more or fewer wires in this box, you MUST consult a qualified electrician. 5. 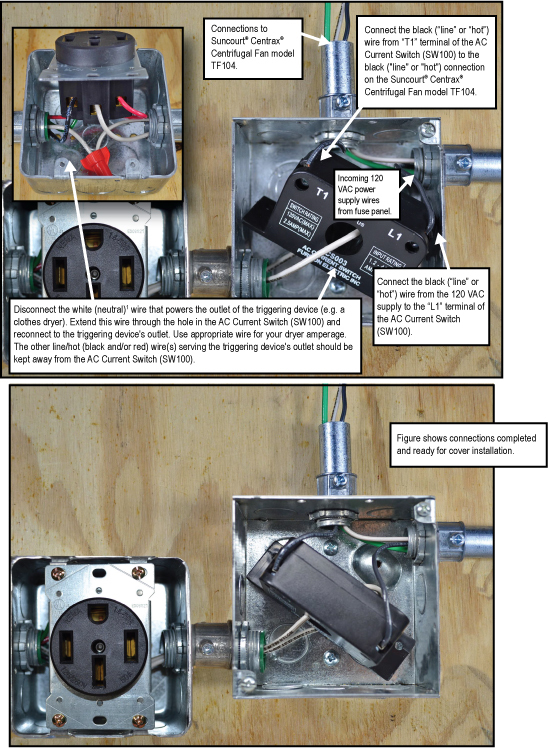 Disconnect the White common (neutral) conductor from the dryer outlet (Figure 3) or disconnect the White wire in hardwired installations (Figure 4) and extend this conductor with a length of wire that is identical to the gauge and temperature rating of the White conductor. 6. This extended White wire will be run into the Current Switch 4” x 4” box and through the hole in the Current Switch and then return to the terminal on the dryer outlet (Figure 3) or the White wire going to the clothes dryer. (Figure 4). The electricity going through this White conductor looped through the Current Switch makes the Current Switch turn ON when the dryer is operating. 7. Check the wiring and connections and re-install the electrical dryer outlet and cover plate. 8. Run 3 new wires (minimum 14 Gauge, 105ºC), Black (line or hot), White (common or neutral) and Green (ground) 120 VAC to the service panel with a new breaker, or pick up the Black, White and Green wires from a nearby 120 VAC outlet. The new Black conductor connects to terminal L1 on the Current Switch. 9. Run a new Black conductor from the DRY04 to terminal T1 on the Current Switch. The new White and Green wires connect directly to the terminal block of the DRY04. 10. All new wiring must be rated 14 Gauge minimum, 105ºC. and installed in rigid ½” conduit or metal flexible conduit terminated at electrical boxes with the correct conduit connectors. 11. Install the cover plate on the box containing the Current Switch. Check your work thoroughly to ensure the installation is totally correct to reduce the risk of fire, electrical shock or injury. Refer to all previous Warnings in these Installation and Operating Instructions. WARNING: Before beginning, always turn the power OFF at the service panel and lock or display a prominent tag on the panel to ensure the power is not accidentally turned back on. To reduce the need for maintenance, make sure the lint filter of your dryer is not damaged, has no holes in it, is securely in place and is cleaned after each drying load. 1. The motor bearings of your DRY04 are permanently sealed. No periodic maintenance is required. 2. The DRY04 fan housing and impeller may become contaminated with lint. Inspect the interior of the fan at least twice a year and more often if reduced air output or vibration of the DRY04 is observed. Do not operate your DRY04 if excessive vibration is noticed. 3. Remove the duct pipe from the intake of the DRY04 and remove any lint buildup that you notice. Make sure that you do not dislodge the metal fan balancing clips on the impeller vanes. 4. Reconnect the duct intake pipe and turn the power back ON. a. Shipping damage occurs. Claims must be filed with the freight company within 1 (one) week. b. Damage results from faulty installation or electrical wiring. d Damage results from: Incorrect wiring, voltage, voltage spikes from lightning or other sources. f. The DRY04 is altered or modified in any form whatsoever, including unauthorized repair. g. Suncourt ID label is removed. h. Damage or failure is due to an act of God. i. This product is used in other than a residential application. This Limited Warranty is given in lieu of all other warranties, guarantees and conditions on manufacturer’s part and manufacturer shall have no tortious or other liability with respect to this dryer booster kit. 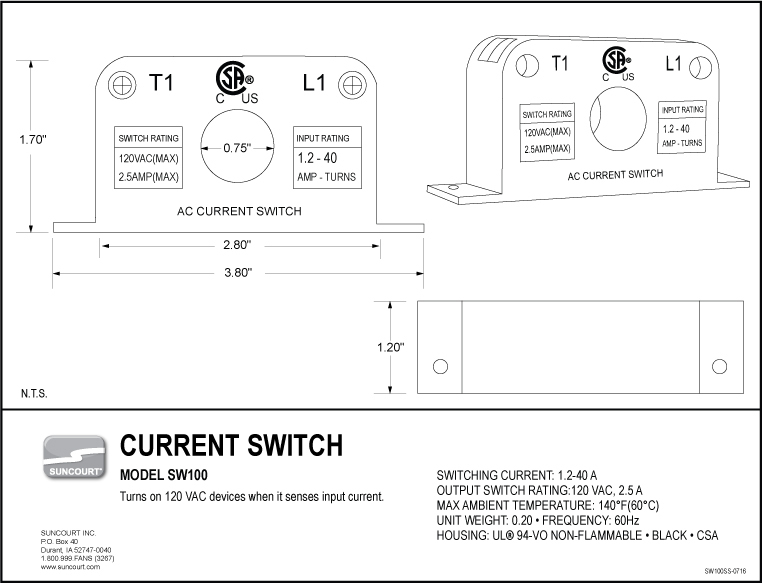 The AC Current Switch (SW100) can be used to switch on and off remote devices with an amp draw up to 2.5 amps, (e.g. a Suncourt® Centrax® Centrifugal Fan). The AC Current Switch (SW100) will provide power to a remote device when the white (neutral) wire from a triggering device (e.g. 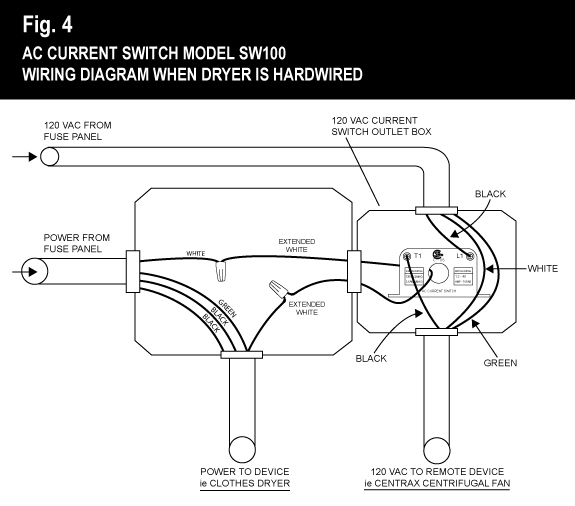 a clothes dryer) carrying 1.2 – 40 amps passes through the center of the AC Current Switch (SW100). Before servicing or cleaning unit, switch power off at service panel and lock service panel to prevent power from being switched on accidentally. When the service disconnecting means cannot be locked, securely fasten a prominent warning device, such as a tag, to the service panel. Suncourt Inc. does not provide electrical connection information. For your safety and protection follow all instructions and adhere to applicable building and/or electrical codes. WARNING – Prior to Installation, switch the power off at service panel and lock service panel to prevent power from being switched on accidentally. Power must be off to the device you are switching and the device that you are sensing the current from. WARNING - To reduce the risk of fire, electrical shock or death, observe the following: Installation work and electrical wiring must be done by qualified person(s) in accordance with all applicable Codes and Standards, including fire-rated construction. WARNING - The combustion airflow needed for safe operation of fuel burning equipment may be affected by this unit’s operation. Follow the heating equipment manufacturer’s guideline and safety standards such as those published by the National Fire Protection Association (NFPA), and the American Society for Heating, Refrigeration and Air Conditioning Engineers (ASHRAE), and local code authorities. Attach an approved junction box next to the existing junction box (or outlet) of the triggering device (e.g. a clothes dryer). This new box will house the AC Current Switch (SW100). This new box requires a blank cover plate. Disconnect the white (neutral)1 wire that powers the outlet of the triggering device (e.g. a clothes dryer). Extend this wire through the hole in the AC Current Switch (SW100) and reconnect to the triggering device's outlet. The other line/hot (black and/or red) wire(s) serving the triggering device’s outlet should be kept away from the AC Current Switch (SW100). Run a 120VAC power supply cable to the new junction box. This will serve as the remote device's (e.g. a Suncourt® Centrax® Centrifugal Fan) power supply. Extend the neutral and ground wires to the remote device (e.g. 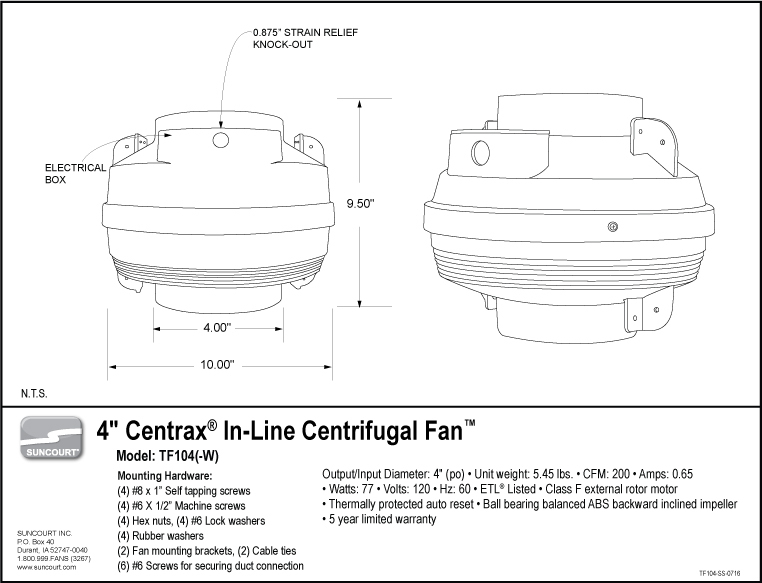 a Suncourt® Centrax® Centrifugal Fan). Connect the black (“line” or “hot”) wire from the 120 VAC supply to the “L1” terminal of the AC Current Switch (SW100). Connect the black (“line” or “hot”) wire from “T1” terminal of the AC Current Switch (SW100) to the black ("line" or "hot") connection on the remote device (e.g. a Suncourt® Centrax® Centrifugal Fan). Example for dryer sensing pictured below. 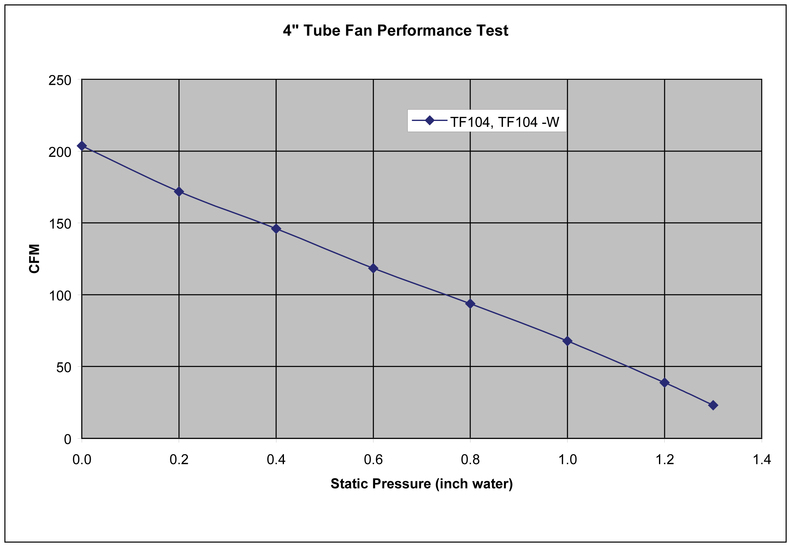 In this example the remote device is the Suncourt® Centrax® Centrifugal Fan model TF104. 1. For best results, always begin by putting the dryer's white (neutral) wire through the hole of the AC Current Switch (SW100). This configuration works with most common dryers. In some less common dryers, the neutral wire does not produce enough current to trigger the current switch. 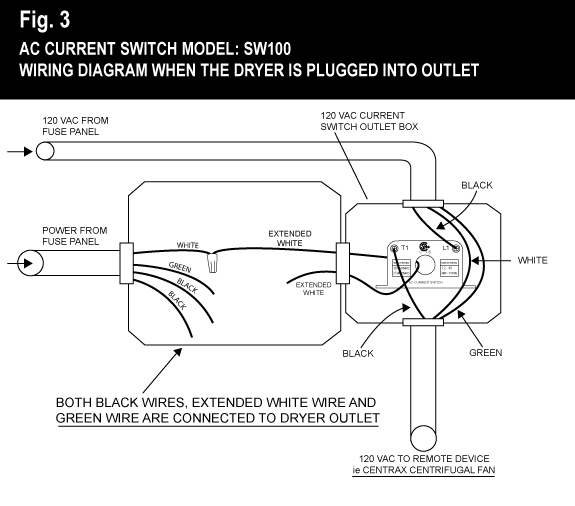 Remove the white (neutral) wire from the hole of the AC Current Switch (SW100) and insert either of the dryer's "hot" wires (red or black) instead. Always only put one conductor through the hole of the AC Current Switch (SW100) while keeping other conductors away. Subject to the following limitations, the manufacturer warrants to the original purchaser that each new product is free from defects in material and workmanship and agrees to repair or replace under this warranty any defective product or part as follows from the original date of purchase for a period of one (1) year. Products sold damaged or incomplete, sold “as is”, sold reconditioned or used as rental equipment. Delivery, installation or normal adjustments explained in the owner’s manual. Damage or liability caused by shipping, improper handling, improper installation, incorrect voltage, current in excess of the 2.5 A switch rating or improper wiring, improper maintenance, improper modification, or the use of accessories and/or attachments not specifically recommended by the manufacturer. Repairs necessary because of operator abuse or negligence, or the failure to install, operate, maintain and store the product according to the instructions in the owner’s manual. Damage caused by cold, heat, rain, excessive humidity, corrosive environments and materials, or other contaminants. Expendable items that become worn during normal use. Freight costs from customer to vender. Repair and transportation costs of products or parts determined not to be defective. Any incidental, indirect or consequential loss, damage, or expense that may result from any defect, failure or malfunction of the product. Some states do not allow the exclusion or limitation of consequential damages so the above exclusions or limitations may not apply to you. Some states do not allow the exclusion or limitations on how long an implied warranty lasts, so the above limitations may not apply to you. You may have other rights which vary from state to state. A defective unit must be returned, prepaid, with proof of purchase, well packaged to avoid damage in transit. Ship unit to Suncourt Inc. only after obtaining a Return Goods Authorization (RGA) number. Returns without this RGA number will not be accepted. What’s a Suncourt® Centrax® Dryer Boosting Kit? Suncourt® Centrax® Dryer Boosting Kits also known as Dryer Vent Boosters and Clothes Dryer Vent Boosters are prepackaged kits that are installed to boost the exhaust from dryers that have long duct runs to the outside. The kit consists of a Centrax® centrifugal fan, current switch, and mounting hardware. Why would I need a Suncourt® Centrax® Dryer Boosting Kit? Your clothes take a very long time to dry. Your dryer keeps running for an excessively long time. You have heavy lint build up in your dryer duct. What happens if I have this problem over time? The cost to run your dryer for longer times to dry your clothes is higher because you are using more electricity. Increased wear and tear on your dryer means you will have to replace it much sooner. Lint build up in your duct can become a fire hazard. How does a Suncourt® Centrax® Dryer Boosting Kit Work? The Centrax® Dryer Vent Booster Fan is installed in the dryer vent duct line not less than six feet from the dryer. The Centrax® Dryer Vent Booster Fan requires 120-volt power. The current switch is installed per instructions to the clothes dryer power and wired to the Dryer Vent Booster Fan. The current switch will turn the fan on when it senses power going to the dryer and turn it off when it no longer senses power going to the dryer. The current switch is a more dependable method of operating a Dryer Vent Booster Fan compared to pressure switches that can clog with lint over time. The current switch is completely out of the air stream and can never clog. The Suncourt® Centrax® Dryer Booster Fan draws 1.0 amps or less (depending on model) making these kits one of the most reliable and energy saving Dryer Boosting Kits on the market. Quiet and efficient fan-The impeller is properly balanced and paired with the motor. Backward inclined blades- allows the Dryer Booster Fan to generate high pressure to get through longer duct runs and help prevent lint clogging the fan. Effective in high temperatures-140 degrees F/60 degrees C.-works with most electric clothes dryers on the market. Thermal overload for extremely high temperatures-if temperatures get too high it will shut itself down. Automatic reset-when the fan cools down it will automatically reset itself without you searching for a button to push.